The Kasilof River is a large glacial system draining Tustumena Lake, and emptying into Upper Cook Inlet after approximately 20 river miles. Personal use fisheries are allowed only at the mouth of the Kasilof, which is approximately 180 highway miles south of Anchorage. There are both dipnet and gillnet personal use salmon fisheries allowed on the Kasilof River. See "Permits & Regulations" tab, above. There are no inherent rights establishing a set gillnet fishing site. The placement of signs, running lines, stakes, buoys, or dry nets on the beach in anticipation of tides does not constitute any prior right to a net location. 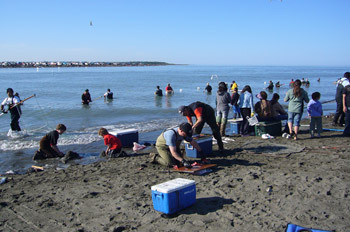 Kasilof River personal use salmon dipnetting is open June 25 through August 7. Dipnetting on the Kasilof is allowed 24-hours per day, 7-days per week. No king salmon may be kept in the Kasilof River personal use dipnet fishery. Remember, this fishery is managed in-season by emergency order, and can close at any time. Always check the recorded phone message or at your local ADF&G office before going fishing. The Division of Commercial Fisheries operates sonar equipment just upstream of the Sterling Highway bridge to estimate inriver return of Kasilof River salmon. Sonar data show that Kasilof River salmon go past the sonar site as early as June 15 and as late as July 31. Since the sonar site is upriver, daily sonar estimates do not reflect the number of fish present on that day at the mouth of the Kasilof River. To date, the Department has not done any research to determine how long it takes a salmon to travel from the mouth upstream to the Sterling Highway bridge. The Department does have harvest data as reported on the required personal use permit. These data show that peak sockeye salmon harvest for set gillnetters at the mouth of the Kasilof River takes place between June 17 through June 23, and peak king salmon harvest June 16 through June 20. 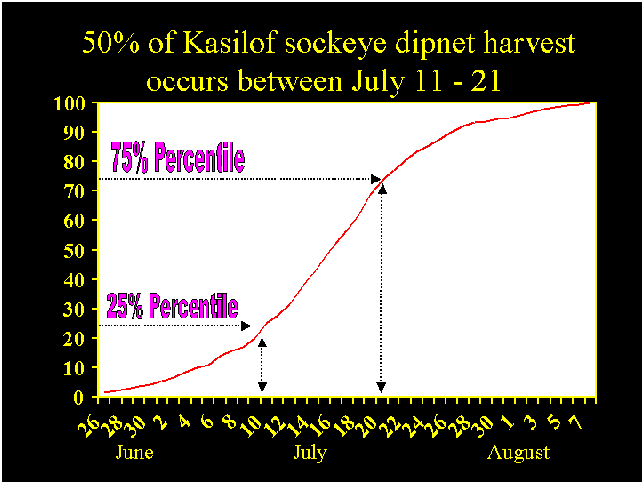 These data also show that peak harvest for dipnetters at the mouth of the Kasilof River takes place between July 11 through July 21. To access the north shore, take Kasilof Beach Road, which is off the south end of Kalifornsky Beach Road. Do not drive through the private property signs at the cannery. You may park your vehicle off the driving surface, but staying within the road right-of-way. Four-wheel drive is recommended due to the softness of the sand off the driving surface. Please do not park on the sand dunes -- the beach grasses can not survive the impacts. To access the south shore, turn west on North Cohoe Loop Road, off the Sterling Highway. When the pavement turns to the south (left), continue west (straight) on the rough, unpaved dirt road to the beach. The mouth of the Kasilof is approximately ¼-mile north (right) along the beach. Four-wheel-drive is necessary to get to the mouth on the south shore. Don't drive anything you can't get unstuck, such as a motorhome, down the beach. It is very expensive to get towed. Dipnetting from a boat is allowed during the same open season and times as dipnetting from shore. The same permit, harvest limits, and marking requirements apply. All your personal use fish must be recorded on the permit and the tail fins clipped before leaving the designated personal use fishing area, or you may be subject to a fine. The open area is the same as that of the shore dipnetting area. There are no nearby public boat launches. The public boat launch is just upstream of the Sterling Highway bridge. All other boating regulations remain in effect, including use and availability of PFDs, laws against drinking and boating, and more. There are no public campgrounds at the mouth Kasilof River. The closest State Parks campground is the Crooked Creek State Recreation Area. There are a few commercial lodging facilities in the area. Since trash and toilet services are not provided, be prepared to pack out everything you pack in. No open fires are allowed within 25 feet of any vegetation. Open fires are permitted only during times of low fire danger, only on the beach and only below the high tide line. Don't drive trucks, cars, or ATVs/4-wheelers across the dunes. Each time a vehicle crosses the dunes, no matter the size or the speed, more damage is caused to the beach grass. Driving on the dunes causes erosion of the dunes. The dunes hold the mouth of the river in place and prevent saltwater flooding of lowland areas. Traveling on the dunes will break up the grass roots that are holding the dunes in place. To use a vehicle to access the fisheries, you must drive along the shore above the high tide mark but below the dunes.